Landmarks events don't occur very often in life, and as advancements in technology come and go, the landmark evens come less frequently. Consider the area of transportation. For centuries, we relied on the brute force approach, while in the last 125 years we have gone from horse-drawn carriages to steam powered and gas powered engines, on to flight and eventually to space travel. The last major landmark is now more than 30 years in the past, and it's difficult to say what will happen next. We can see similar progress in the realm of computing, and narrowing things down a bit in the history of Microsoft. There have been a few major transitions over the past 25 or so years. 8-bit to 16-bit computing was a massive step forward, with address spaces increasing from 20-bit to 24-bit and a nearly complete rewrite of the entire Operating System. The transition from 16-bit to 32-bit came quite a bit later, and it happened in stages. First we got the hardware with the 386, and over the next five years we began to see software that utilized the added instructions and power that 32-bit computing provided. The benefits were all there, but it required quite a bit of effort to realize them, and it wasn't until the introduction of Windows NT and/or Windows 95 that we really saw the shift away from the old 16-bit model and into the new 32-bit world. You can see the historical perspective in the following slide. Keep in mind that while there are many more releases in the modern era (post 1993), many of the releases are incremental upgrades. 95 to 98 to Me were not major events, and many people skipped the last version. Similarly, NT 4.0 to 2000 to XP while all useful upgrades didn't exactly shake the foundations of computing. The next transition is now upon us. Of course we're talking about the official launch of Windows XP 64. It has taken a long time for us to really begin to reach the limits of 32-bit computing (at least on the desktop), and while the transition may not be as bumpy as the change from 16 to 32-bits, there will still be some differences and the accompanying transitional period. This year's WinHEC (Windows Hardware Engineering Conference) focused on the advancements that the new 64-bit OS will bring, as well as taking a look at other technologies that are due in the next couple of years. Gates characterized the early 16-bit days of Windows as an exploration into what was useful. For many people, the initial question was often "why bother with a GUI?" After the first decade of Windows, the question was no longer present, as most people had come to accept the GUI as a common sense solution. 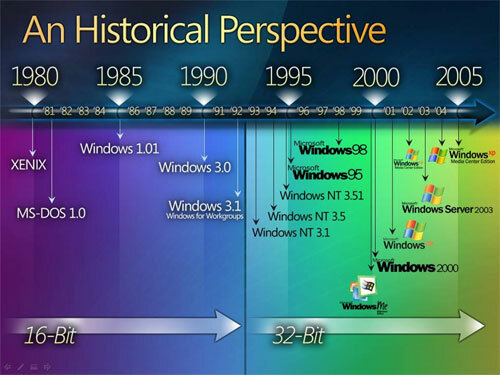 The second decade of Windows was characterized by increases in productivity and the change to 32-bit platforms. Gates suggested that the third decade of Windows and the shift to 64-bits will bring the greatest increases in productivity as well as the most competition that we have yet seen. There's a typo on page 4 in the 6th paragraph. It reads "The next example given was of SQL Server 2003". It should be "The next example given was of SQL Server 2005". Typo: Page 7, "Thoughts on the Longhorn Driver Model". Second paragraph, last line. #10 I always wondered how many more people would try Linux, but were scared off by the hatred and snobbery of so many of its users. I've seen this news about hybrid harddrives a few places, but I keep wondering about the nand flash on these drives. "An Historical" is grammatically correct British. American English uses "A Historical". I believe either are OK no matter where you are. Do a Google search on "grammar "an historical"" (must have the "an historical" in quotes or google will throw out the "an").